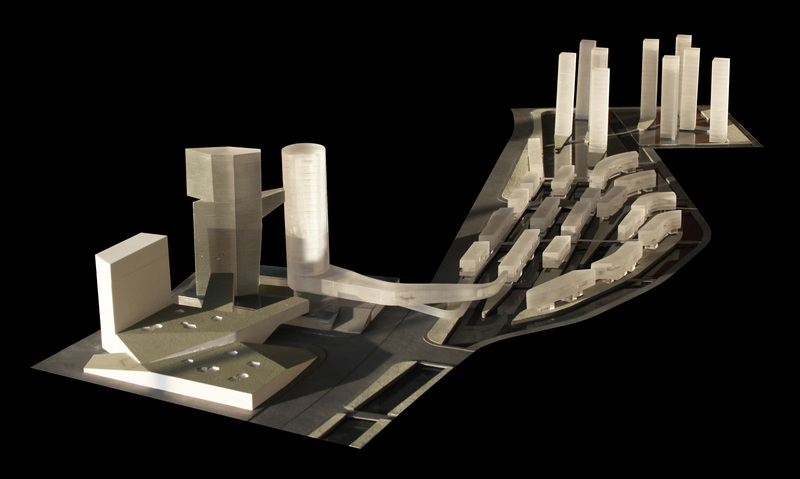 In 2010, Steven Holl Architects won the design competition for the renovation of a former industrial site for oxygen and boiler systems in Hangzhou, China. 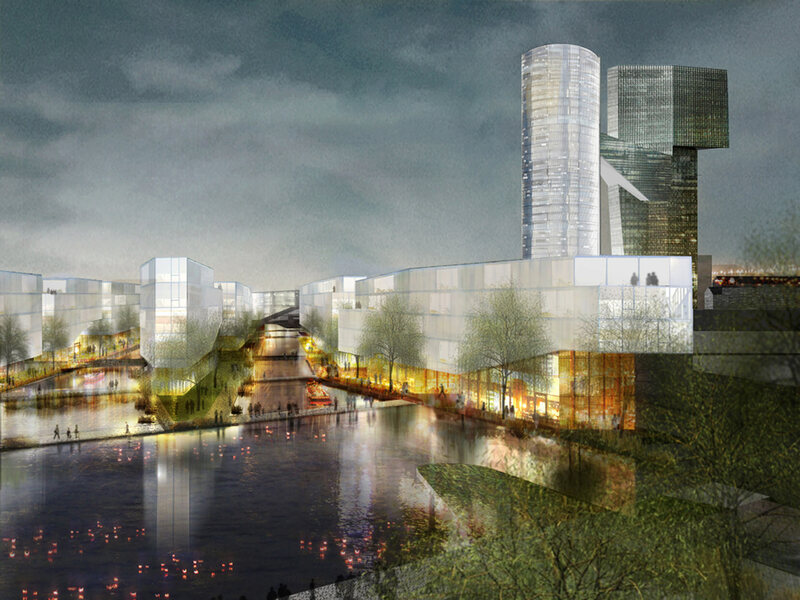 The master plan for the international tourism complex includes residential towers, an exhibition center, an art gallery, and restaurants as well as performance and exhibition rooms. The design of SHAN-SHUI (mountain and water), also called "BOW-TIE" (because of its tie shape), relies on five large-format elements. 1.) The circular WATER TOWER rises from a water surface and connects to a curved bridge that crosses a road in the north. This tower of diffused glass houses apartments and offices with retail at the base and a restaurant with event space on top. 2.) The hybrid buildings of the CANAL SPREADER create space to live by the water along an existing canal and five new ones. They offer different forms of living as well as offices, cafes, restaurants and shops along public roads. 3.) The LANTERN TOWERs are inspired by the old stone lanterns in West Lake, which set fire to the water. PV glass curtains gain solar energy during the day; at night every tower "glows" with special Fresnel glass and reflects the energy of the day in the water. One loft apartment per floor is connected by lift to the community lobbies under the pond. Health club, spa, retail shopping and parking can be found in the lower levels. 4.) The MOUNTAIN TOWER in the middle of the grounds is connected by an escalator to a function room at the top of the WATER TOWER. Translucent ceramic surrounds this tower, its roof is green. 5.) Landscape and architecture merge in the adjacent 3D PARK. The public green roofs have openings that connect the lower levels with nature and light. There is a 200-room hotel, a spa and restaurants that open to the rooftop gardens; to a pedestrian connection, lined with shops. For SHAN-SHUI, the sustainability design team goes far beyond energy-saving issues. The aim is to provide more well-being, e.g. to improve the quality of the water of the channels and the soil with new technologies such as hydroponics and Terra Preta. Transsolar's contributions to sustainability at LATERN TOWERS include rainwater and gray water storage for the roofs. On the west facades, PV modules are to gain electrical energy. Attached in a sawtooth formation, they are efficiently exposed to the sun, and the 30 ° incline reflects much sunlight and reduces transmission. For all rooms, the room depth was calculated so that they are optimally supplied with daylight. This saves electrical energy in the artificial lighting, including in the residential buildings of the CANAL SPREADER. Operable windows provide natural ventilation. The roof of the 3D PARK building also provides shade to the water below. Underwater PV systems are installed on the base. There they rarely need to be cleaned and work effectively in the cool of the water. The open structure of the building is optimized for natural ventilation. The thermal mass of the roof buffers heat peak loads, makes the night ventilation more efficient and makes it possible to make the capacity of the plants smaller. Radiant cooling systems on the ceilings provide energy-efficient and quieter than air cooling for comfort. The ceiling cooling system is combined with a source ventilation. In this case, the ventilation rate is reduced, since only the occupied space is specifically ventilated. The geothermal system dissipates waste heat from the cooling system.